Press Release - American Crocodile Education Sanctuary - December 28, 2011 - The Treasurer of the Edmonton Reptile & Amphibian Society (ERAS), Ollie Meidinger, visited ACES Educational Crocodile Eco-Sanctuary in Ladyville last week, and made a site visit to the ACES Ambergris Crocodile Refuge on Ambergris Caye. 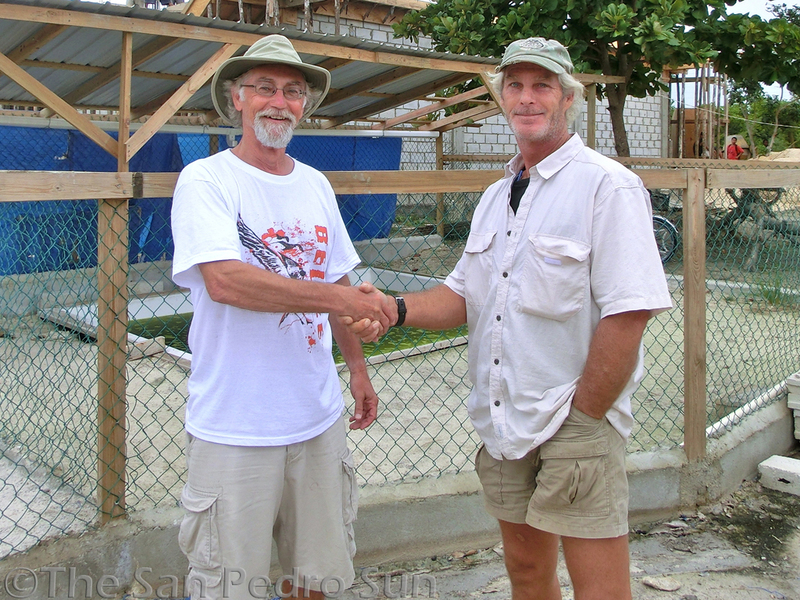 He is pictured below presenting Vince Rose, Crocodile Expert of the American Crocodile Education Sanctuary (ACES), with a generous donation of $5000US. Founded in 1994, The Edmonton Reptile & Amphibian Society’s mission is to promote the study and conservation of reptiles and amphibians and the facilitation of communication between society members. Cherie Rose, Research Biologist of ACES, would like to clarify that they are in the process of constructing a small educational crocodile refuge on the island. The refuge will be located on property owned by Mario Cervoni, adjacent a fresh food store that he is constructing a couple miles north of San Pedro. While this facility, when complete, will care for ill, injured, and hatchling crocodiles, the land is not conducive to the permanent containment of large problematic crocodiles. In that sense it is not a croc sanctuary, but better described as a rehabilitation facility for the treatment and/or care of ill/injured crocs that can be hopefully re-released into the wild, and as a short term holding facility for large problematic crocodiles until arrangements can be made for their transportation to the Ladyville facility. Currently there is only one resident crocodile in the facility while it is under construction, a small severely injured croc with a broken jaw. Rose would like to assure concerned residents that no dangerous crocs will be permanently housed there, and upon funding, perimeter fencing will be in place for the safety of both humans and the captive crocs. “We are hopeful that the residents and communities of Ambergris Caye will acknowledge the benefits of this facility and realize the urgent need for a much larger, natural, crocodile sanctuary (similar to the one in Ladyville verified by the Global Federation of Animal Sanctuaries) somewhere on the island in the near future,” stated Rose. Noche de Estrellas 2012 – don’t miss it! !